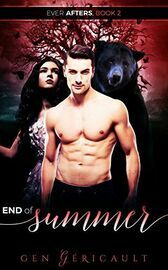 Grizzly shifter Braxton Afters is a creature of chaos. He wrestles with his beast every waking day. Even constant brawls at the local bar don’t sate its ire. Add on the strain of a decade-long curse, and you have one angry, aimless bear. As his final summer draws to an end, Braxton doubts he’ll ever find a mate who could put up with both him and his inner monster. Grace Florrie knows monsters. She’s painted them often enough thanks to her animal’s unorthodox gifts. Grace never thought of her visions as a blessing, though. Their horror taught her to keep a tight grip on herself. Control, after all, is the only way she maintains her sanity. When Braxton rescues Grace from the sinister schemes of a wicked witch, he has no idea that Grace might just rescue him in return. With the equinox looming over Ever Afters Farm and Orchards, chaos and control collide. Can Braxton and Grace find a balance even as the mystery surrounding the Afters sleuth unfurls around them? This full-length novel is available with Kindle Unlimited.